When building a web application you often reach a place where you’ll have to render a similar element multiple times and as efficiently as possible. That’s when a lot of web developers start reaching out to frameworks and libraries such as React, Vue or Angular. But what if we only want to do efficient templating and don’t want the tooling & code overhead of these libraries? One library that aims to solve this problem is lit-html by the Polymer team. It uses browser-native functionality such as <template/> tags and tagged template literals to create efficient templating. 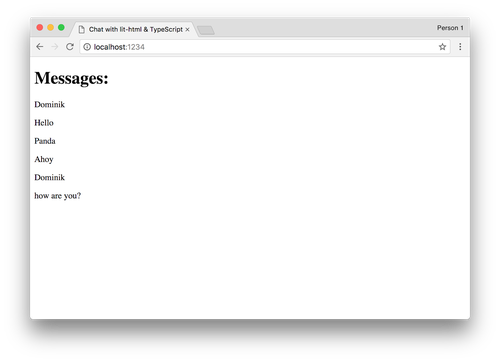 Let’s take a look at how we can use it by building a Twilio Chat application with lit-html. Before we get started make sure that you have Node.js and npm installed. Since we’ll be using Twilio Chat at one point in this application, you want to get a Twilio account as well. Sign up for free. Before we get to the lit-html part we need to configure two things. lit-html comes as an npm module that we’ll have to bundle into an application. We’ll be using zero configuration bundler called Parcel for this but if you feel more comfortable with Webpack, you are welcome to use that one. We’ll also be using TypeScript for this project since both lit-html and Twilio Chat have excellent support for TypeScript. 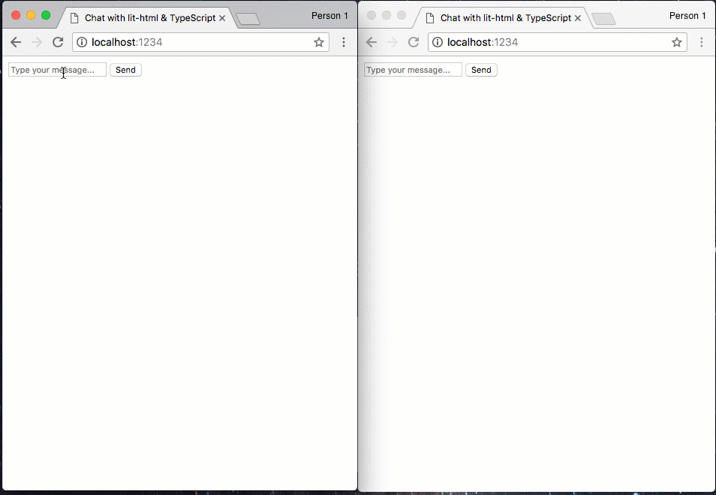 So far we are rendering something very static to the page without using lit-html. Let’s dip our toes into lit-html with a small task first. Let’s render the same content we previously had, plus the current time and update it every second. The render function will then take care of actually rendering the content to the page. If you still have the parcel dev server running from earlier, you should be able to switch back to http://localhost:1234 in your browser and see the page updated with a date constantly updating. This is similar to stateless components in React. We are using a helper function from lit-html called repeat that allows us to efficiently loop over an array to render each component. The function receives a list of items and two functions, one to identify a key to check which items updated and one to render the content. We are using msg.sid for uniqueness as this will be a unique key for every message once we integrate Twilio Chat. Let’s move the entire chat related logic into a central place that will handle rendering the interface as well as updating it when necessary. We’ll be using lit-extended in this case rather than the normal lit-html to render the view. This enables us to use features such as event listeners. In order to use the Twilio Chat SDK we’ll need to use a client token. We’ll take care generating this later but for now we’ll pass it in the constructor of the Chat class and a channelName of the channel we want to join and a root HTML element that we want to render content into. Before we can test our code, we need to configure Twilio Chat. Log into the Twilio Console. Go to the Chat dashboard and create a new Chat service. For every user we’ll have to generate a unique access token for Chat. For now we’ll just use a test token that you can generate inside the Chat Testing Tools. Type in an arbitrary “Client Identity” (think username) and generate the token. Right now we have hard-coded the access token and that’s not ideal. You should instead generate this token dynamically server-side and either assign people different usernames or prompt them to create a username. 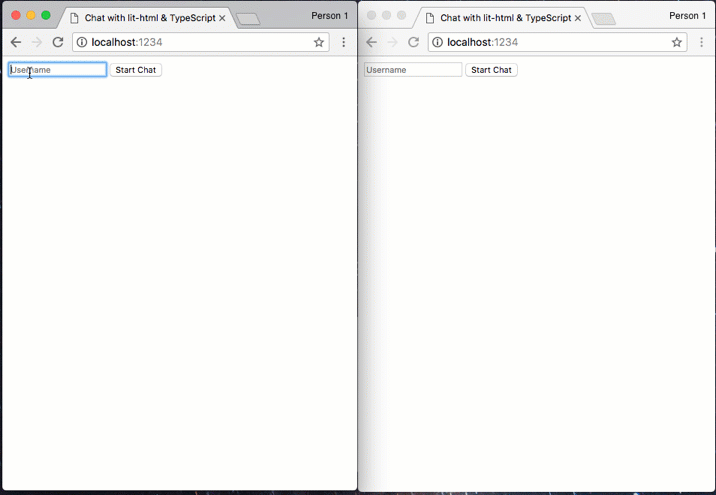 We are also loading the entire Twilio Chat SDK on page load. What if the person got to the page but doesn’t actually want to chat? Let’s modify our code to fetch a token dynamically and also make use of a concept called code-splitting by dynamically loading the chat related code if the user actually wants to chat. To generate the access token we’ll be using Twilio Functions which allow you to host serverless functions written in Node.js directly on the Twilio infrastructure. Make sure to replace the value of SERVICE_SID with the SID for your Chat Service. Save the Twilio Function and copy the path for later use. If you are using Twilio Functions for the first time, you’ll also want to go into the Configure section, enable ACCOUNT_SID and add entries for an API_KEY and API_SECRET that you can generate a pair of them here. Your chat should work just like before, except that you can now have multiple users chat with different usernames. Give it a try by opening two windows at once. That’s it. 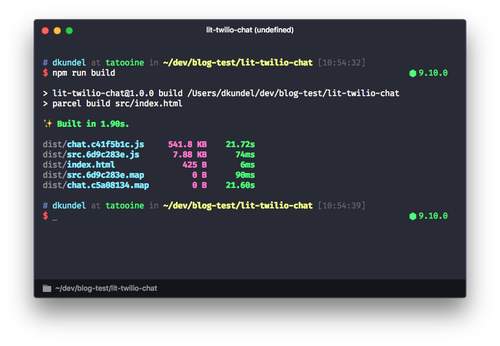 We built a chat UI that is small and lightweight yet handles performant re-rendering thanks to lit-html. We were also able to leverage code-splitting to further improve the page load time by only loading the things that are necessary on initial page load thanks to parcel‘s out-of-the-box support for it. This will create a bunch of files in a folder called dist that you can serve from any static hosting service or upload to the Twilio Runtime Assets to serve.